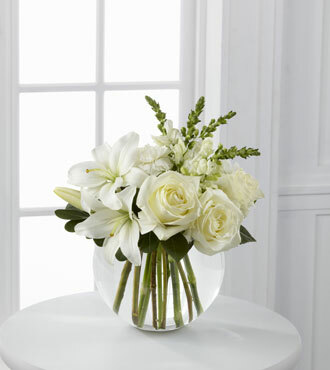 Hand-designed in a stunning glass bubble bowl as a gesture of comfort and support, The FTD® Special Blessings™ Bouquet is shipped fresh, budding, and ready to bloom. These gorgeous white flowers are hand-picked and ready to help you express your sympathy, say thanks, congratulate a friend or loved one, or deliver a token of happiness for an engagement or wedding. White roses, Asiatic lilies, snapdragons, carnations and vibrant greens are a stunning testament that will leave a lasting impression. Order today for same-day delivery. Add some chocolates or a stuffed bear to your order for an extra bit of love.